In today’s Divi tutorial we’ll show you, step by step, how to make a fixed navigation on your website when scrolling and after you’ve passed the height of your fullscreen. If you follow the steps in this post and recreate the fixed navigation, you’ll see that the navigation will bring a nice interacting effect to your primary menu and to your website in general. We’re going to start off by creating a normal vertical navigation on the screen. Instead of being at the top of the page, this navigation will be pushed to the bottom of the screen. 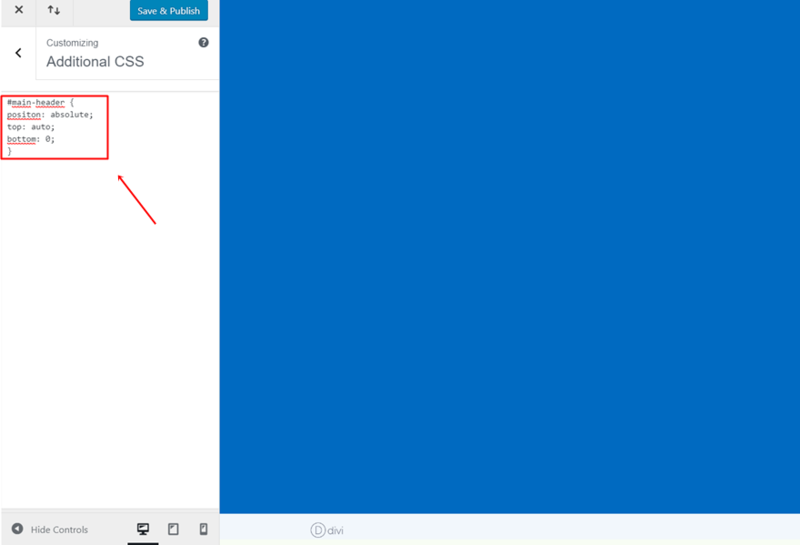 After scrolling and once you’ve passed the menu height of the screen, you’ll see that the menu will change its position and will get placed on the top of the page. Once the navigation becomes fixed, it will remain fixed throughout the rest of the page. But once you scroll back to the hero section, the navigation will behave normally again and will get placed at the bottom of the hero section. There’s one thing to take into consideration when you’re going to use this effect for your website; you need a fullscreen mode Header Module. 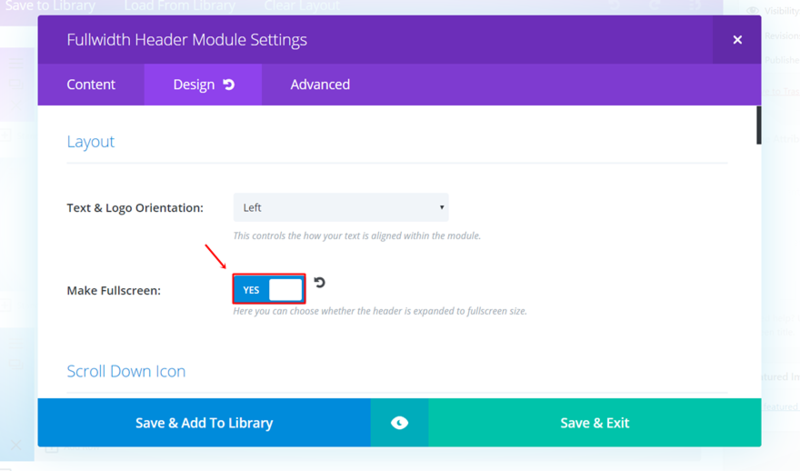 Theoretically, you can apply this to other modules and sections as well, but you’ll have to make some modifications to make sure the menu appears at the bottom of that section. 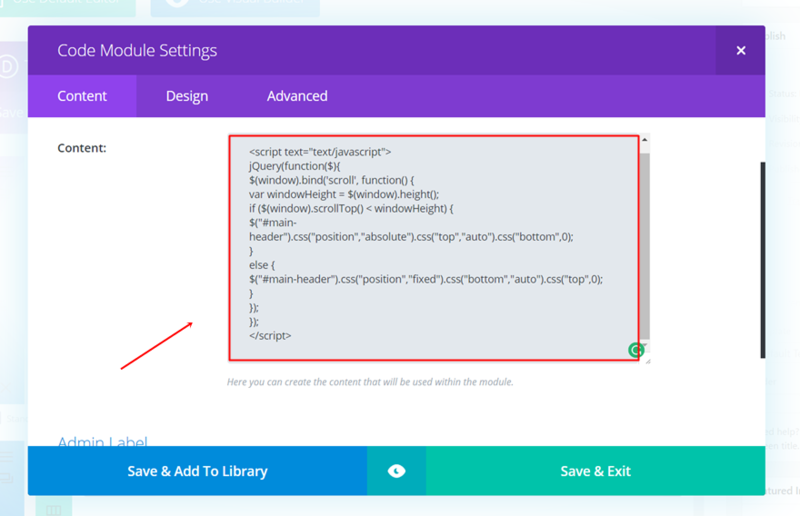 The fullscreen option Divi offers makes sure the hero section fills the screen (whatever the measures of the screen might be), that’s why we recommend using it if you want to apply this effect to your menu. Start by opening or creating the page where you want to add this effect. Next, open the Fullwidth Header or create it and go to the Design tab. The first thing you’ll come across in the design tab is the Layout subcategory. Go ahead and enable the Fullscreen mode in that subcategory. To add the effect to our website, we’ll need to make use of both some CSS code lines and some jQuery code lines. The CSS code we’ll be using will put the navigation at the bottom of the screen and will make it behave like a normal footer before the jQuery code is activated. After that, the jQuery code lines will take over from the custom CSS code and will let the navigation behave according to your position on the website. We’ll start by adding the required CSS code to our website. Generally, there are three ways to do this. The first two ways make the code apply to the whole website. The third method makes it work for one page only. The first method we’ll show you lets you add the code through the Theme Customizer. This is a way of adding code is not that often used but it has some perks. One of them is that as soon as you’ve added the code, you’ll notice the changes happen in real time. 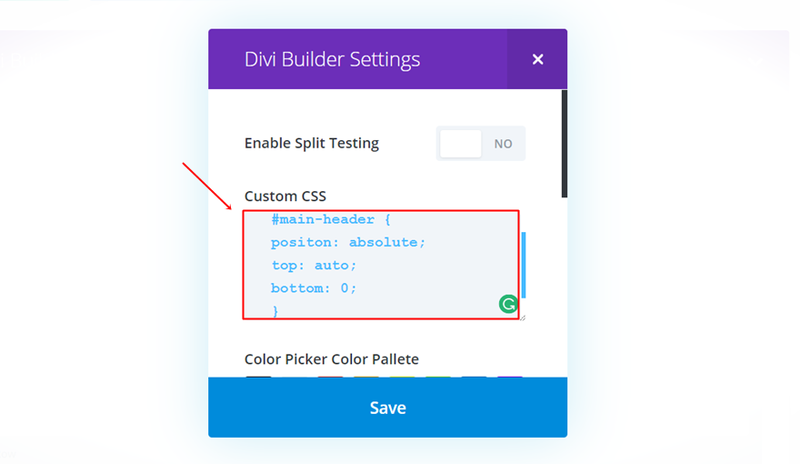 Another option you have, which is also the most common one used, is adding the CSS code to the Theme Options of your Divi website. Once you’ve added the code, it’ll apply to the whole website. If you’re rather looking for a possibility that adds the effect to one page only, move on to the next possibility where you can add the code to one page in particular. This possibility might be interesting if you want to apply this fixed navigation to one page only but not the rest of the website. If you’re using the fullwidth header on the homepage only, for instance, you might want to use this method. The next step we want to take is adding the jQuery code to our WordPress website. This code will start to work from the moment you scroll. 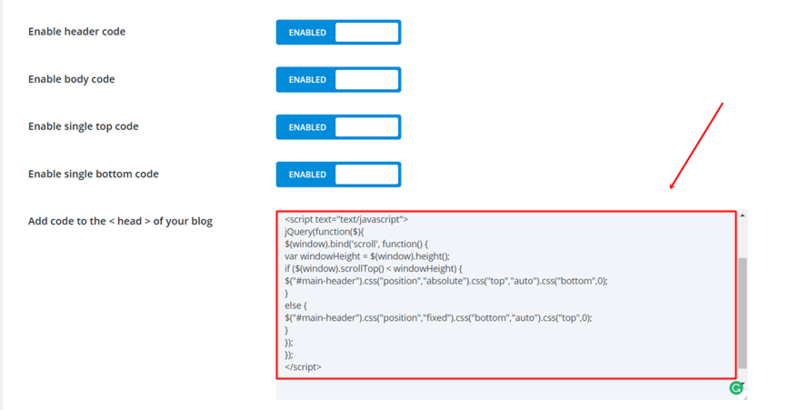 We can add the jQuery code in two ways; through the Theme Options or through the Code Module. If you want to add the code to one page only, you can use the Code Module in combination with the third possibility we mentioned for the CSS code in this post. If you want to add the code to one page in particular, you can do that through the Code Module. In the previous part, where we’ve added the CSS code, you must’ve chosen the last option. And that’s it! The code should now work, transform your menu and make your website a bit more interactive. In this post, we showed you how to create a fixed navigation when scrolling. We provided you with some CSS code lines and some jQuery code lines that should do the trick. If you’ve followed this post step by step, you should be able to get the final result. If you have any questions or suggestions for upcoming posts; feel free to leave a comment in the comment section below! Do you have a live website where this can be viewed? Thanks. Add me to the list who would love to see a demo; I have been taking Divi for a testdrive all day and thought to myself (once I figured out how to add the menu), man, it would be nice if this could position the menu right on the fold and have it ‘dock’ once it got to the top. Boom—stumbled on this post! Great info, so long awaited, thank you very much! This was a big mysterium till now! I like this effect, thank you very much for the tutorial! What exactly happens to this effect on mobile screens with the Hamburger (icon) navigation? Do I have to add some media queries to prevent any trouble? I just implemented this on my test site and there is an issue with the mobile menu. The links open off-page/below-visible-screen. I fixed this issue for anyone having it. My bad. Had a misplaced closing bracket in the JS above. My menu is still at the top when I scroll down the menu now moves to the center. If I add my background image in the Full-Width Header it does the same thing only the menu is through the center of the image. Can you give me some ideas to try to change this? Disable sticky nav in the Divi Settings Page. See if that helps. I had some wierdness and disabling that helped mine. Did anyone actually get this to work? I’ve tried the single page example on three different sites but it doesn’t work on any of them. If you did get it to work please post a link so we can what it should look like. Nice! This would be very useful. Would this work with only css position:sticky too? Mine was doing this too & then it seemed to go away – except when the page loads, it shows the menu at the top. Then you scroll down (even a tiny amount) & it jumps to the bottom. As you scroll, the fixed nav pops up & even when you scroll all the way back up, it does stay at the bottom. Anyone know how to get it to be on the bottom when the page loads? You have to use both the CSS code and jQuery code to avoid that, Jess. Thanks Donjete for your post, I always learn !! We have the option of adding a full-screen video at the beginning of a page, either in the background of a Section or a Row. Although only the Pause option is included. The problem is that when it starts with the audio activated by default it can be really annoying and more being advertising. This only works when the theme settings have been set to “fixed navigation : disabled”. But how can we use this in such a way.. all pages have a fixed navigation, but only one page uses this type of navigation? Amazing! I posted a few times on the divi forum asking for help with this exact issue. Thank you! I think it is in this part of the JQuery code that will make it load at the bottom so that you do not have to scroll to force it to the bottom. I am just not sure what. I have tried several options. Sadly it did not work for me! Menu bar sits in the vertical center of the image. I want it underneath the fullwidth image. Anyone experienced that same issue. All code was applied to online this page, not to the entire site! Thank you for this detailed and useful tutorial (and everyone posting about different issues and solutions they’ve found)! To extend this idea a bit further, how could one adjust the code to make this effect work for the filterable portfolio? In effect, once someone views a filterable portfolio, I would like the filter categories to remain fixed at the top when scrolling. This would be particularly useful for a large number of portfolio items, allowing the user to filter through different items without having to scroll back to the top (of the portfolio). Thanks again for your great work and all these resources!